There is a museum in the office Annex building at East nada. Many rare offerings by devotees to the Lord are exhibited here. 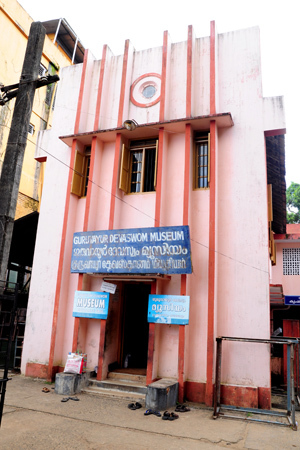 The museum is kept open from 8.00 am to 8.00pm on all days except Tuesdays and other holydays. The spacious auditorium on the right side of the East Gopuram commemorates the great saint poet Melpathur Narayana Bhattathiri, who worshipped Lord Guruvayoorappan by composing superb devotional classic Narayaneeyam and miraculously recovered from an accute affliction of paralysis. Devotional functions such as spiritual discourse, perfomance of traditional forms,classical music and symposia on cultural and spiritual topics are held here. The auditorium has a spacious stage with attached green room. This hall accommodates more than 2000 people. the auditorium is given on rental for functions that are offered to LORD. In connection with the Ashtami Rohini(August - September), the birthday of Lord Krishna, the Sapthaham is conducted in such a way that the chapter of Krishna's birth(Avatharam) is recited on the Ashtami Rohini day. The spiritual discourses are held during Vaisakha month(April - May), Ramayana Masa(July - August)and Mandala Pooja(November - December)i the Melpathur Auditorium. 1. It is only permitted to book auditorium within 60 days. 2. The parent or teacher of the students should come into the office for booking auditorium. 3. A copy of id proof (self attested) and a recommendation letter from the teacher should be enclosed with application. 4. One parent/teacher is allowed to book only once in a year. 5. A copy of aadhar card of students should be enclosed with the application. 6. The applied parent/teacher should be there at the time of performance conducted on the stage. 7. Devaswom has the right to change the date or cancel the booking. 8. Additional permission is to be obtained for live telecasting,installing additional light and sound systems. 9. The stage should be kept clean after the programe. Guruvayoor Devaswom has established a fully centralized A/C hall named "Poonthanam Auditorium" with all modern facilities which will be given on rental for marriage/cultural programmes. 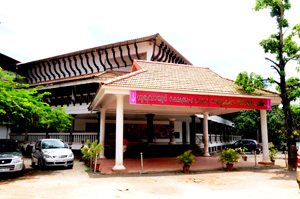 the hall deidcated for the memory of great poet Poonthanam autor of jnanappana and Guruvayoor satyagraha.